Composed of over a 100 pieces in letter-form, ‘In triplicate’ takes disintegration of meaning as its starting point. It could be described as a visual form of Chinese Whispers. 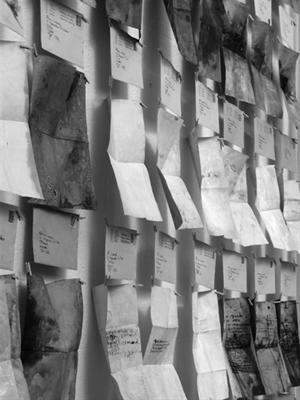 To begin with the concept appeared straight forward – to take a body of given words and replicate them three times on the same piece of paper and then repeat the process and see what would happen – but as I progressed I felt the need to make the pieces less legible. The work became a metaphor for the way meaning is distorted and misunderstood and I wanted to reflect this dilemma more as the piece evolved. As part of the process I then posted them into the world to be returned back where they started - a symbolic journey representing the futility of trying to find concrete meaning.